There's really not much to say other than: Happy Thanksgiving. With all that is wrong in the world it's good to have a day to remember what's right. 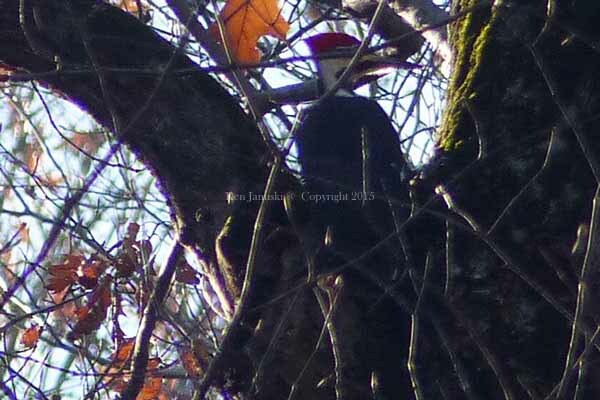 Among today's reminders was this male Pileated Woodpecker, seen with a female. 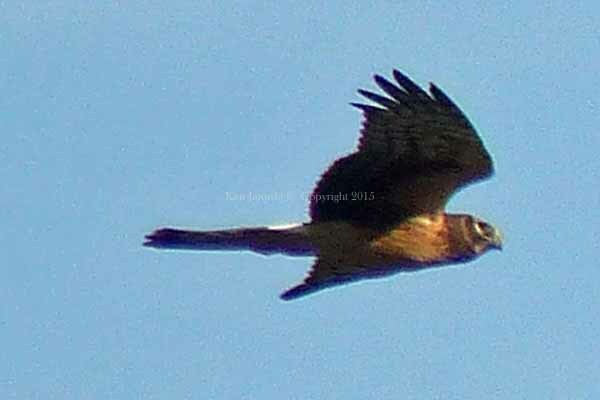 Recently we've also seen Northern Harriers at Dixon Meadow Preserve. There was a time when I would have greatly question the likelihood of seeing harriers just a few miles from home. 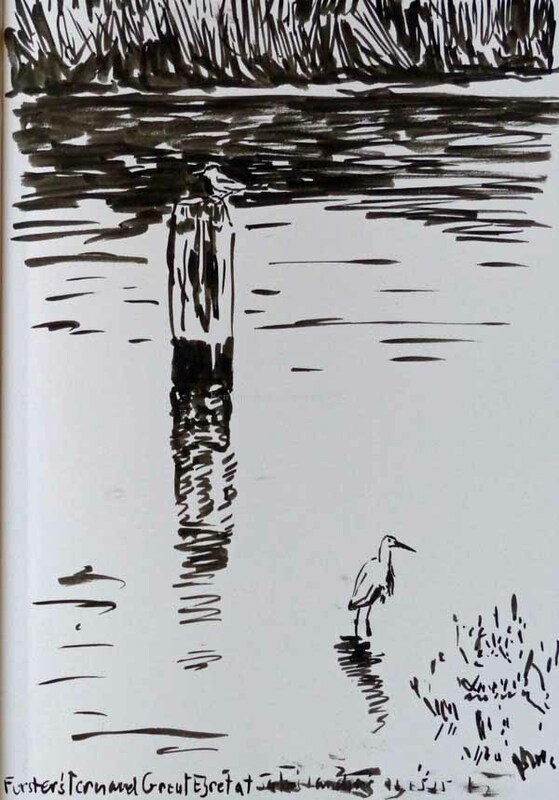 And I've been dabbling with more sumi brush pen sketches. The most recent ones are seen below. Greater Yellowlegs and Green Heron on Log. 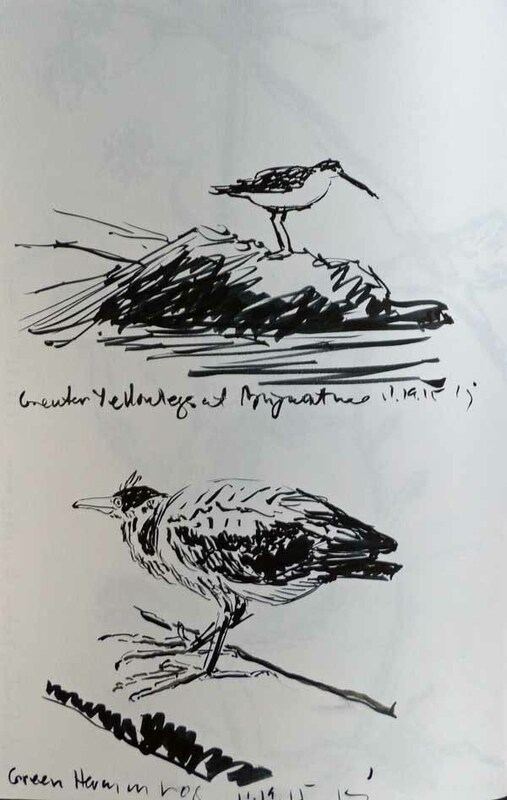 Brush Pen Sketches by Ken Januski. 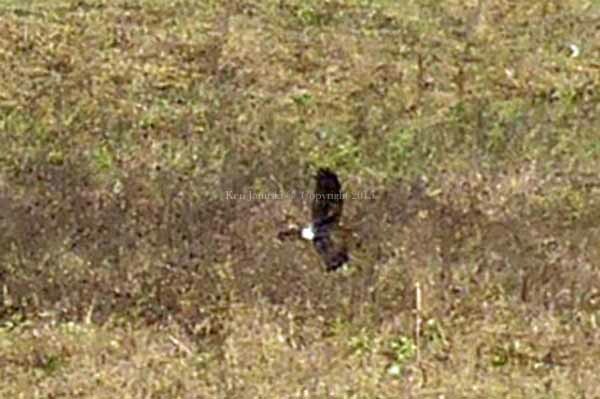 Northern Harrier at Dixon Meadow Preserve. Photo by Ken Januski. 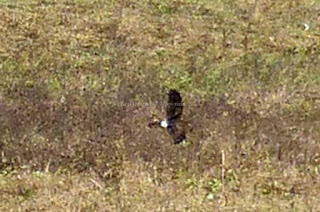 Northern Harrier seen a week earlier at Dixon Meadow Preserve. Photo by Ken Januski. Great Egret on Stump. 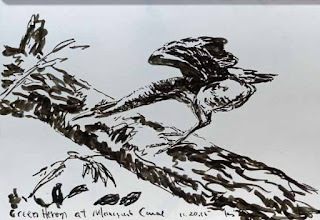 Brush Pen Sketch by Ken Januski. Young Green Heron on Tree Along Manayunk Canal. 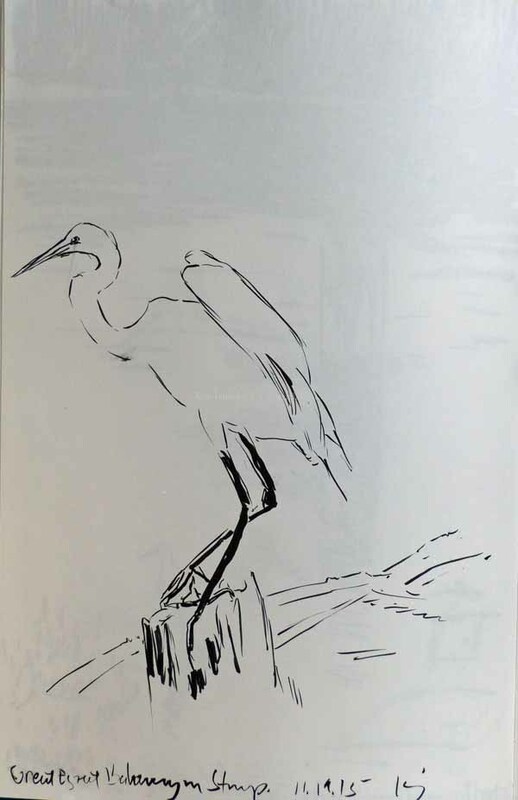 Brush Pen Sketch by Ken Januski. I think it's been a week since I finished the combined linocut/woodcut of Winter Wren in leaves. But it's been a busy time and I haven't gotten around to showing it here yet. One of the reasons for the delay is that I've been out walking and birding and taking some photos. As the weather gets colder it's harder to convince myself to sketch from life outside. 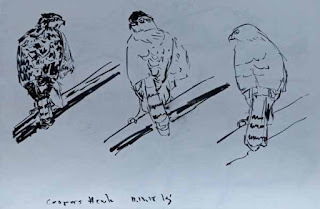 I inevitably start going through my photos and field sketches looking for a subject for a new painting or print. That was the case recently with most of these brush pen (either Kuretake or Pentel) sketches. 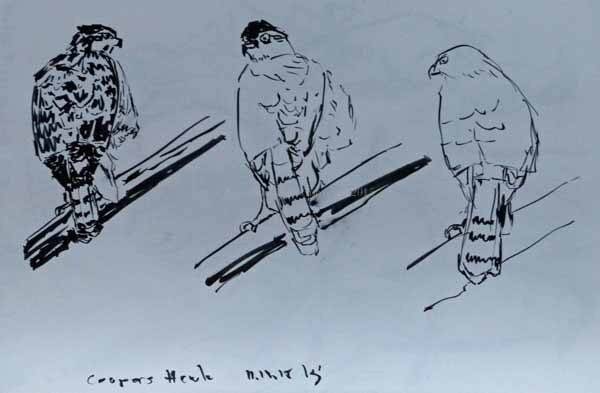 All but the Cooper's Hawk are from photos taken earlier this year. The earliest, above is a Great Egret with Forster's Tern at Jake's Landing near Cape May, NJ. 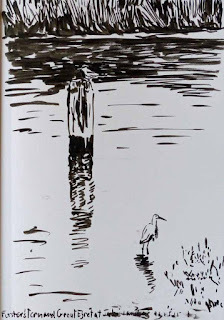 I liked the scene but made a mistake in bringing the dark reflections on the water down so low that the tern more or less disappeared. 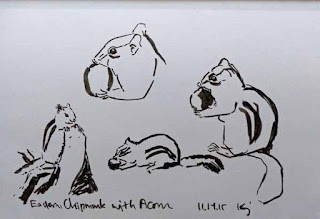 More recently I've seen a number of Eastern Chipmunks. Though I'd like to sketch them live, and occasionally they do sit still, I'm so unfamiliar with them that working from photos seemed like good practice. And of course the unadulterated cuteness of chipmunk and acorn was hard to ignore. The Eastern Towhee above was I think from early spring. As usual I like it when I can see the full bird, head to toe. 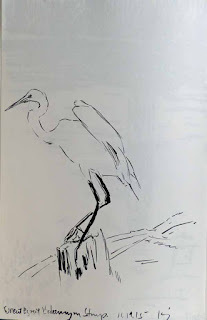 That makes it easier and to me more worthwhile sketching. With the full bird in sight it's much easier to get a sense of movement, weight, balance. As usual it is hard to exaggerate the size of the tail. The only recent photo was the basis of the sketch above. It is a Cooper's Hawk. You may agree with me that the one on the far right, where I ignored the feathers to a large extent, is much more successful. One of the things that I most like about using a brush pen is that I'm forced to be both simple, quick and decisive. It doesn't lend itself to tentative strokes. And so I think there is an immediacy and sense of spontaneity that is appealing. On the other hand if you make a mistake you have to live with it, as in one of the chipmunk sketches above where the arm is much too small and out of scale. I continue to do these sketches because I learn from them. And I'd like to incorporate their simplicity in my prints. Time will tell. 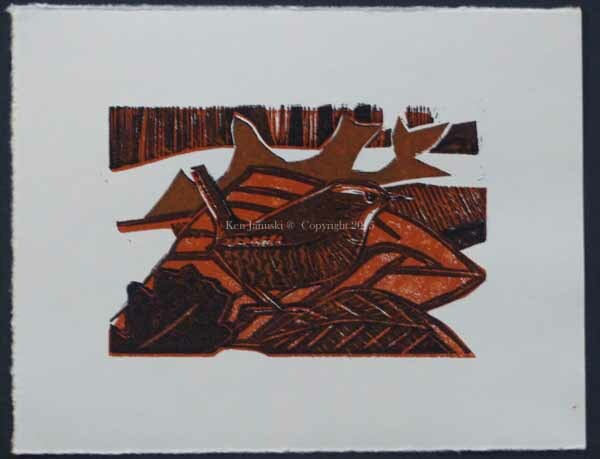 And finally the completed print of a Winter Wren in leaves. It is a combination print of linocut and woodcut. I printed it a few years ago as a black linocut. But I always felt that it wasn't as colorful as it might be. Since I wanted to experiment with a new water-soluble ink I returned to it as the basis for a color print. I printed the original linocut in black using the new ink, Caligo Safe-wash. I then used my old Daniel Smith ink to print orange on a woodblock and overprint the black. I then went back to the linocut and printed a Daniel Smith brown after having cut away more of the block to that some of the color created by orange over black remained. My intent was to cut a little more of the linocut away and then print Caligo black on top of the entire print. But as I proofed I kept feeling that the black was too dominant. I also found that the Caligo was too glossy and out of keeping with the more matte Daniel Smith. So in the end I carved away most of the linoleum block and then printed what remained with the very little Daniel Smith black that I still have. I am happy with this and it's fulfilled my goal to a large extent of making the original Winter Wren print much more colorful. 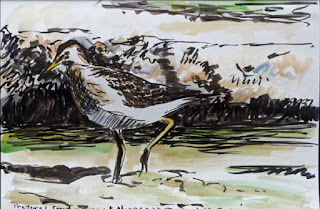 Pectoral Sandpiper at Morris Arboretum Wetlands. Brush Pen and Watercolor by Ken Januski. There is one premier birding location in the Philadelphia area, John Heinz NWR, also know as Tinicum. But for us it's not the most enjoyable drive and almost always involves some rush hour traffic on busy highways. Perhaps the early morning traffic will be light but that won't be the case on the way home. For that and other reasons we spend most of our time birding closer to home when we're in Philadelphia. We're very fortunate to have so many good birding areas, and just plain good natural areas, within a few miles of our house: the Wissahickon Valley, the Manayunk Canal and Schuylkill River, Andorra Natural Area, Houston Meadows, Schuylkill Center for Environmental Education, and Morris Arboretum to name the ones where we spend the most time. We originally joined Morris many years ago for the vegetation. We're interested in flowers and herbs, but also in shrubs and trees, particularly native ones. But the more time we spent at Morris the more we realized that there were a lot of birds there, particularly near the natural wetlands near the entrance. 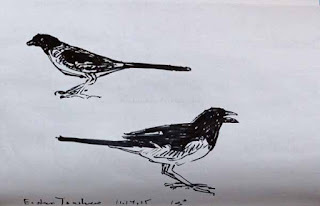 As our birding skills have improved, and as I've spent more time sketching the birds I see, our list of birds seen at Morris has grown. 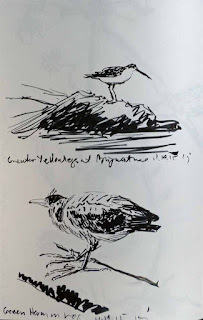 Recently we saw a Pectoral Sandpiper there, the 150th bird seen at Morris according to e-bird, and our 130th bird. The Facebook page for Morris recently howed a photo I took of the Pectoral along with my American Goldfinch Eating Thistle, based on a sketch from Morris. Above is a quick sketch using two different brush pens and watercolor of the Pectoral. 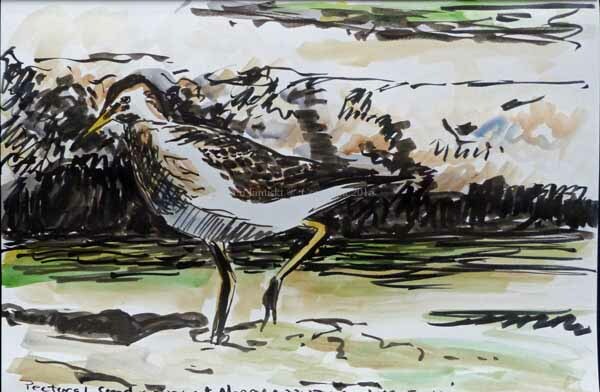 About a year ago Kenn Kaufmann wrote an article in Bird Watcher's Digest about all the birds that go unnoticed and unreported because birders tend to stick to known hotspots. I think that the 150th species seen at Morris shows how true this is. Birds are in many places, not just hotspots like Heinz NWR. It's really worthwhile to explore other areas, especially ones so close to home. Morris has done a lot to develop/protect the natural wetlands area and I think it shows in all the birds that are now possibilities there. And it is a very beautiful place in every other aspect as well. Winter Wren in Leaves. Third Stage of Combination Woodcut/Linocut by Ken Januski. 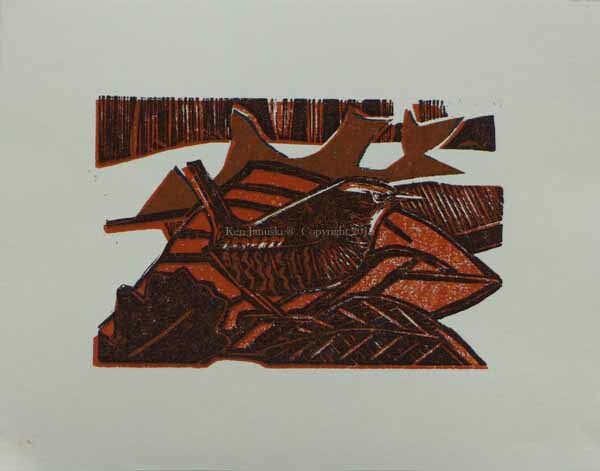 I haven't given up on the reworked Winter Wren print. But I have needed to let the ink dry between colors. This is a photo of one of the prints on good paper. It first was printed in black, from the original linoleum block. I then printed orange from a new woodblock. I then printed brown from the original linoleum block, but with some areas carved away so that the brown created by the orange on top of the black showed through. Now it is time to print just black I think, again after carving away more of the linoleum block. The ink is probably dry enough now on the prints. But I need to figure out what to carve away and how muck black to use, assuming that I don't decide against the black. Prints are always full of decisions, including abandoning a central part of the original plan.